"Good morning kaboberz!!! We are on our way to GWU, Tysons, and Cap South!!! #kabobon"
Love this truck, and I love the veggie platter, which mostly consists of chickpeas over rice, plus a mild sauce. One gets two vegetable sides with it, unfortunately those are usually very limited. Either more chickpeas, sauted veggies (which are squash, etc..), or spinach. I would very much like more options, like the potatoes displayed in the menu. Also, so look forward to nonstyrofoam food containers! The food on this truck is YUMMY! The chicken was tender and flavorful, the chickpeas were cooked perfectly and the spice was just right. Not to mention they give you a really nice large portion for only $9.00. I'll definitely be back! The Tasty gyro's big pluses include with tender & well seasoned chicken, a delicious sauce, and the pita is lightly toasted to perfection. The combination is amazing. I just wish they were at Friendship Heights more often. A delicious meal with generous servings. It's the best. While all the other trucks are raising their prices, I've noticed that Tasty Kabob has actually dropped its prices recently. Amazing. I hope this is a sign of their success and that they will continue to serve the DC market for a long time. Chicken Gyro - extra hungry (which means more meat). Well flavored, tender chicken, tasty pita... definitely one of my favorites. Worth the $1 upgrade for more meat. Great lamb, chickpeas and spinach, but the "salad" below the meat is hardly more than a few chunks of chopped up lettuce. They have multiple trucks and you will probably be able to find one nearby. This was my first recent food truck experience. Wow! The lamb gyro was excellent, and prepared quickly. Will definitely come back when they're in the area. Thanks! Great value for the price. The grill combo had large chunks of grilled lamb and chicken--it was probably about a pound. I had it over salad but it was really mostly meat. I had okra and chickpeas as my sides. The okra had a tomato-y sauce and was seasoned well. The chickpeas probably came from a can and could use more seasoning. Super fast service--my food was up when he was done swiping my credit card. Fast service and polite staff. I asked for the lamb gyro with "medium" spice fearing it would be spicy, but it just tasted like a traditional gyro. Fast service and polite staff. I asked for the lamb gyro with "medium" spice fearing it would be spicy, but it just tasted like a traditional gyro. Will try the "hot" next time. Tasty Kabob serves middle-eastern cuisine from a mobile food truck and 2 stationary carts located in Arlington, VA. The food truck launched in March 2011 and is permitted in DC and Arlington. 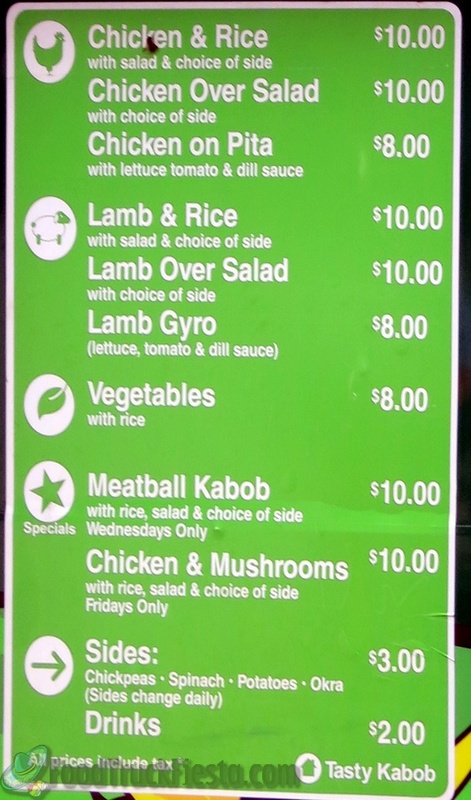 On January 4, 2012, Tasty Kabob listed a 5th truck serving in the District. 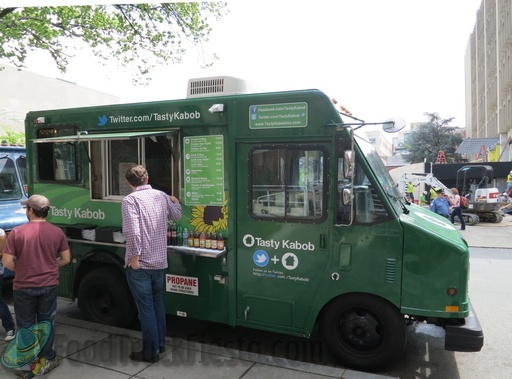 This makes Tasty Kabob the largest company of food trucks serving in Washington DC.